This latest twin exposé comes after three prominent writers from CNN were ‘urged to resign’ (fired) after the network was threatened with an estimated $100 million dollar lawsuit (something which 21WIRE predicted) earlier this week following a bogus story (since retracted) that falsely linked political figure and financier Anthony Scaramucci to a Russian investment fund currently under a congressional probe. The US media has been floating the ‘blame Russia’ meme for almost a year, and even more conveniently over this past 2016 US presidential election cycle, before morphing into the dodgy dossier that included unverified Trump-Russia claims. Incredibly, the still as of yet unsubstantiated Russia-Trump collusion story briefly vanished, only to be newly reignited again, after two US military missile strikes in Syria and Afghanistan took place following the fabricated sarin chemical attack allegations in April which the White House claimed hit the Al Nusra-held town of Khan Sheikhoun in Syria. Just this week, the US government warned (a story peddled by CNN among others) of an upcoming, soon-to-be-released alleged ‘chemical attack’ out of Syria, something which would potentially prompt another wag the dog theatrical bombing from the US-led Coalition. Is this false flag foreshadowing by Washington? Perhaps such plans may have been scarpered by a blistering report detailing false sarin claims concerning the Idlib province by award-winning investigative journalist Seymour Hersh only days ago. Hersh’s report, appropriately titled “Trump‘s Red Line”confirmed much of what we at 21WIRE managed to outline in the aftermath of the alleged chemical attack, while also condemning the lack of clear evidence and reactionary military response by the Trump administration even after Russia shared deconfliction intelligence with the US. 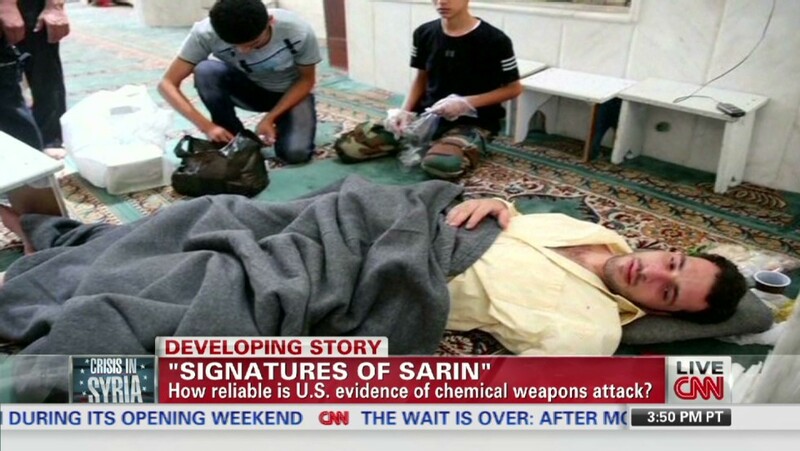 The fallout from the sarin hoax and CNN Russia-gate spin has also been compounded by an embarrassing retraction from the NY Times over their Russian hack/influence claims said to be confirmed by 17 US intelligence agencies – a story which once again turned out to be a falsehood as recently discussed by well-known investigative reporter Robert Parry. Here is where the propaganda goes into overdrive. Suddenly, as if by coincidence (or right on cue) Reuters reports that Syria has ‘heeded’ its warning, almost immediately after Hersh’s stirring investigative effort laid bare many elements of April’s sarin hoax in Syria. That’s right: because it issued a warning based on secret intelligence that no one is allowed to see, Washington is somehow claiming credit for stopping a chemical weapons attack by the Assad regime. As both the Russian and Syria narratives continue to crumble, an awkwardness has set in for CNN and the Trump Administration (its Syria policy duly inherited from the Obama Administration) – both of whom have relied on these narratives to prop-up dysfunctional US foreign policy agendas. “An unusual question is capturing the attention of cyberspecialists, Russia experts and Democratic Party leaders in Philadelphia: Is Vladimir V. Putin trying to meddle in the American presidential election? QUESTION: Why has CNN been peddling Russian collusion allegations without any evidence? The new Project Veritas video stings provide more evidence of an overtly political agenda, something we saw throughout the 2016 US presidential election. In fact, the entire video exposé is reminiscent of Democratic consultant Robert Creamer of Democracy Partners being caught discussing how to commit large-scale voter fraud, while also apparently outlining how to incite violence at campaign rallies. Unbelievably in the year leading up to the 2016 US presidential election, Creamer met with White House officials some 342 times along with his wife, a 9-term Illinois Democratic congresswoman Jan Schakowsky. White House visitor records show that Schakowsky took 47 “private meetings with Obama or his senior staff,” in the year leading up to the election. Furthermore, the Russia-gate plot line perpetuated by CNN immediately recalls the symbiotic relationship between the CIA and American media seen during the Cold War era. In the early 1950’s, the CIA ran a wide-scale program called Operation Mockingbird that was said to have infiltrated the American news media in particular, which propagandized the public through various front organizations, magazines and cultural groups. Is the recent CNN fallout more evidence confirming that a modern version of Operation Mockingbird is alive and well? There has been an unprecedented increase in propaganda over the years from big media, despite claims that the NDAA provision offered more transparency to the American public. “Diversity of personal opinion is what makes CNN strong, we welcome it and embrace it,” an email from a CNN spokesman to the Daily Beast reads. “CNN stands by our medical producer John Bonifield,” it said. CNN Health supervising producer Bonifield, who is not involved in the channel’s political coverage, was videotaped saying the company does not have any evidence to support its Russia-Trump narrative, driven mostly by the desire for ratings. “It’s mostly bullsh*t right now. Like, we don’t have any big giant proof,” the CNN producer can be heard saying in the video, adding that US President Donald Trump is “probably right” to accuse them of a conducting a witch-hunt.